It seems we're right in the middle of our wintertime "slow" period here on the dairy. That's not to say we haven't been busy, we just don't have any major projects going on outside of our daily herd management. We seem to be finding a little something different to do every day, whether it's trimming hooves, fixing fences, or servicing equipment. As far as our cows go, we're currently down to 202 in milk. We had peaked at 213 last week but decided to send a group of open (not pregnant), low-producing cows to the stockyard. Next Monday will be a busy day for the girls as we have a pregnancy-check scheduled for the morning and our monthly DHIA test for the afternoon milking. Beyond that, we'll put together our next group of breeding-ready heifers and also sort and move other heifers to new pastures. The weather certainly hasn't been the best in the world lately, but about what we should expect for this time of year. The temperature has risen since last week's snow and ice, but the past several days have been cool, damp, and overcast. 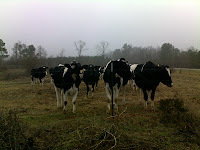 For the most past, though, it hasn't caused us any problems and the cows don't seem to mind. I'll be traveling to Lincoln, Nebraska, this evening and will be speaking at the NEFB's Young Farmers & Ranchers Conference tomorrow night. While the temperature is going to be colder than I'm accustomed to, I've been promised a warm reception and would expect nothing less from my Farm Bureau family. Have a "dairy" good weekend, everyone!